Princess Peach: Princess of the Mushroom Kingdom! She’s here to fight the good fight, namely fighting for her servant’s castle! Does she have what it takes? Amy Rose: Sonic’s self-proclaimed girlfriend. She’s pretty fierce, especially with her Piko Piko Hammer! Will she make up for Eggman’s loss? Bowser: These relentless attacks are wearing us out, even if they are great publicity, we can’t take much more! Mario: Pipe down! (lol, Mario joke) You have a shell, you can take it. Yoshi: Shut it before I eat both of you and poop you back out-the slow way! Amy: SOOOOONIC!!! Are you in here?! Peach: You [[censured]]!!! Get your dirty animal hands off my plump Italian meat-ball! Amy: Italian?! EWW!!! Take him! I don’t want him! Peach: What have you got against Italian?! 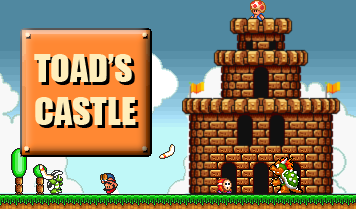 Toadette: Welcome, one and all, to another exciting installment of Toad’s Castle Deathmatches! Toadette: Before we start, we have some bad news…Toad got bonked in the head by an unknown attack…anyway, we have a special guest host today! Give it up for: KIP THE KOOPA!!! Toadette: Uh, you can sit down now. Toadette: Anyway, here’s our referee, Ref Guy! Kip: Now, time for our main event, the Deathmatch! Combatants, please step into the arena! Toad: *watching from hospital TV* Danggit, this is taking freaking forever! Peach: You’ll PAY for what you’ve done! Amy: What have I done? Amy: *eyes widen* You take that back! I’d never do that! Toadette: Wait, when did we get plants planted in the arena? Plants coming from nowhere, weird eh? Kip: Eh, I’ve seen weirder; speaking of which, are you wearing a hat, or is that your head?! Ref Guy: God, why haven’t I been promoted…Peach starts off the fight with a vegetable toss attack, but Amy has dodged it! It seems like Amy is going to jump onto Peach! Toadette: Amazing! I’ve never seen that kind of Passion and aggression in an attack before! They really mean business! Kip: Oh, sorry. It seems that Peach and Amy are both at a staredown! Amy: Coward! You made a little guy take a full attack for you! Peach: Coward? It’s better than living a lie! Peach: You heard me! SONIC. DOESN’T. LIKE. YOU. You know it, but you won’t admit it! Amy: *tears in eyes* I’ll KILL YOU!!! Toadette: Holy Stromboli! That move is illegal in the Mushroom Kingdom, all 50 states, Quebec, Ontario, and Northern Antarctica! Kip: *stares at Ref Guy* Do something! Peach: *gets back up* *pant pant* Look at yourself! You know that it’s true! Sonic doesn’t like you! Peach: Ha! I guess that I’ll be the winner of this match! Sonic: *in audience* So, throwing Amy into the plan was just a distraction for our master to initiate his plan, right? Sonic: Woah, you’re right! Maybe I should go cheer her on! Tails: But you just said that she’s of no strategic importance! Sonic: You never know, she might win! *jumps down the aisles into the front row* You can do it Amy! Amy: Shut up! I never want to see you again! Amy: Over what? The lies?! *cries* You never loved me!!! Amy: *jumps up with a flowery background* SONIC LOVES ME!!! Amy: *goes into killing spree/overkill/ownage mode throwing punches every which way* La-la-la-la-la, la-la-la-la-la-la-la-la-la-la, la-la!!! Ref Guy: Amy is the winner! Amy: Sonic! I won for you!!! *opens eyes* Uh, Sonic? Yoshi: Danggit, where are Smashmatt and Eric! If the rest of the takeover goes like Peach’s match, we’ll NEED there help! Mario: We must fight harder! We’ll all contribute to the group! You guys fight, and I’ll look after Peach and Toad, but mostly Peach! Kip: *voice from far away* That’s for being the least popular character on my show!